Last night was a great night. Spur of the moment my kiddos (my son and his girlfriend) decided to pop by. It was happy for one because we needed his help moving my china hutch. But mostly because ever since we all got our own places I miss the crap out of them! It is funny, we all knew that we needed to move on and get places of our own. But dang it is so had to be away from them, at least for me. It is funny, I spent a lot of the day on Monday unpacking boxes and putting things away in my dining room. We are having about 15 people here for Thanksgiving so I figured it might be a good idea to finally unpack the boxes that have been sitting there for a couple of months. Once I had the boxes unpacked and all of my china and crystal on my dining room table I started to look around at the room and decided I wanted to change how it was arranged. Now it was no surprise to my son, or would it be to anyone that has known me for a long time, but Kevin was kind of hit out of the blue with it. I move furniture all of the time. I have to get a “feel” for the room, and until it feels right I am constantly rearranging. He tried arguing with me about the need to move the hutch, but he eventually backed down. My son could have saved him the time, you will never convince me it doesn’t need to be moved if I think it does! But due to my dining room table be covered with dishes and such, and the days getting so short that it is pitch dark by 5:30 PM here. I am having a heck of a time getting any pictures of my food. Kevin even went to Home Depot last night to pick up some under the counter lights just to help me in the kitchen. As you can see by the pictures, the lights help for cooking, but not so much for picture taking. Oh well, I will figure something out. Now on to the dish. I found this recipe on the internet quite some time ago. 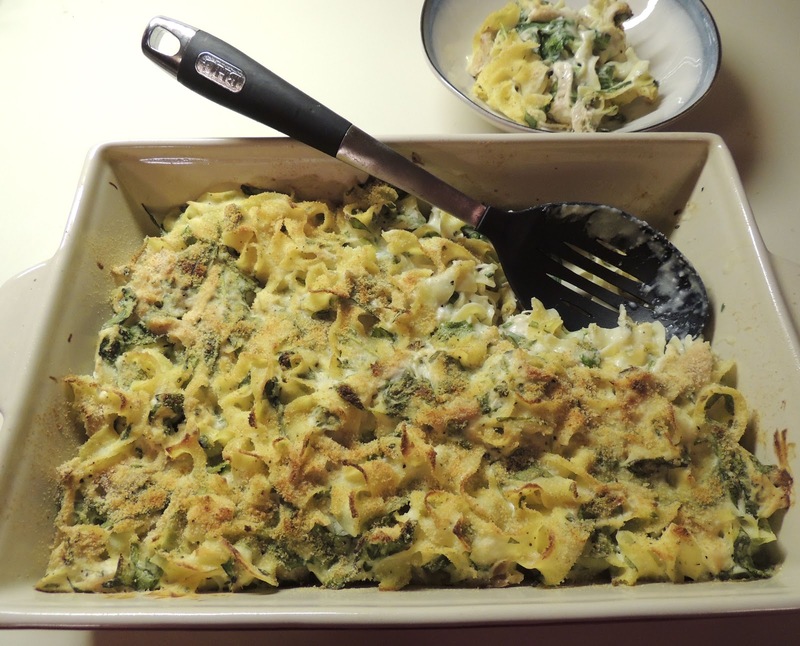 I loved it because I love spinach and chicken and, well who doesn’t love a good casserole? 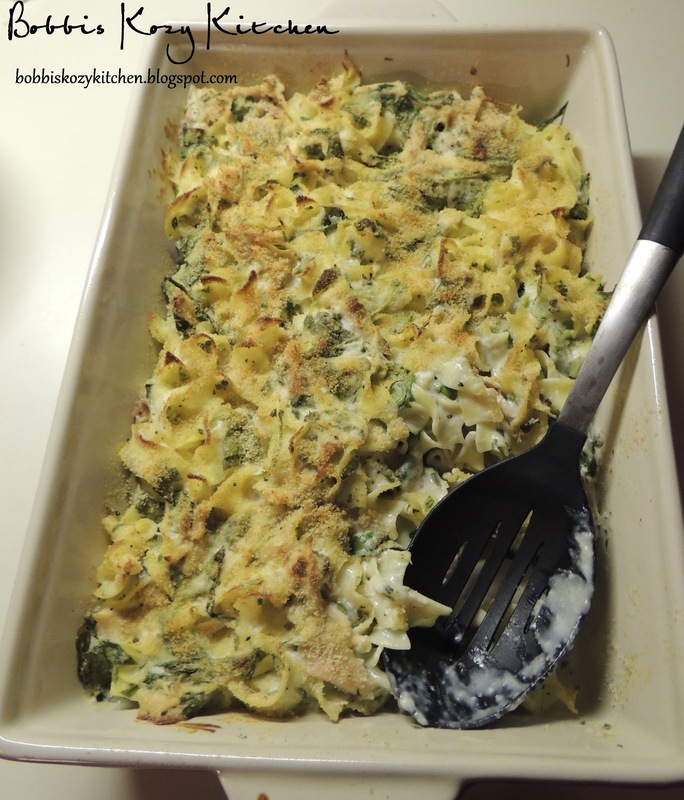 They can be great comfort food and remind me of growing up because my Mom was the casserole Queen. But in those days it was the canned condensed soups that were used as the base. This one didn’t use the soup, but it called for whole milk and sour cream and tons of butter. I knew I could make is so much healthier! The kids and Kevin loved it. I of course am always harder on myself than anyone else. I loved it but felt it didn’t have that “Wow” factor. Kevin pointed out to me that every dish doesn’t have to blow you off your seat, and my son said that he loved it because it was warm and creamy, it was just plain comfort food. We all agreed that if you like a bit of zing you could add some crushed red pepper to it. But it was a great meal for a cold Washington night. We sat in the living room, with the fireplace going, and enjoyed some nice comfort food together. That can never be wrong!! Melt 4 tablespoons of the butter in a large saucepan over medium heat. Add the flour and cook, stirring, until foamy, 1 to 2 minutes (do not let the mixture darken). Add the white wine and whisk for a minute to cook off the alcohol, then slowly add the chicken stock, whisking as you go. Add the sauce, chicken, and spinach to the noodles and toss to combine. Transfer to a 9-by-13-inch or some other 3-quart baking dish, sprinkle with the bread crumbs, and spray the top with butter spray to dampen the crumbs. Bake until the bread crumbs are golden and the filling is bubbling, 10 to 15 minutes. Let cool for 5 minutes before serving.